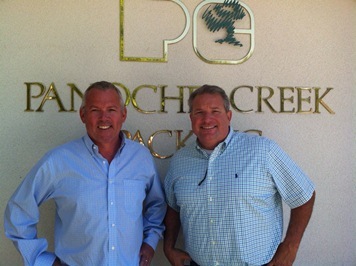 L to R: Ross Blackburn, Frank Roque owners of Panoche Creek Packing, Inc. Farm Bureau members since 1996. The Company was formed in 1982. We are proud to be celebrating our 30th Anniversary! We are an almond handler. We purchase almonds from California growers, process them as natural, blanched, or inshell. We sell and ship them to domestic and foreign buyers. Our packing plant is located in Kerman. California almond growers provide us with 100% of our product. Our buyers from around the world distribute the almonds for a variety of uses including whole, confection, and snack packs. We are supporters of many organizations in the Valley. Agencies that we have contributed to recently include California Water Alliance, Madera County Farm Bureau, Madera County Ag Boosters, Madera 20/30 Club, Children’s Hospital of Central California, Boys and Girls Club, 4-H and FFA, Fresno State Athletics, Kerman Chamber of Commerce 4th of July Event, Madera Stallions Baseball Team, American Cancer Society, Kerman High School, Fabulous Friday at the Races. As one of the largest independent almond handlers, we plan to continue our mission as being the premier almond company supplying quality product to our buyers, great returns for our growers, and economic benefit to our local communities. One of the main issues that we are concerned about for the entire San Joaquin Valley is adequate supply of water to the farmers that supply almonds to us. We put up the seed money to help reactivate Families Protecting the Valley (FPV). Denis Prosperi is chairman of FPV and works diligently with a board of directors that extends from Merced to Kern Counties. They have a website and also send a newsletter frequently via email. To learn more and to sign up for the newsletter, please visit familiesprotectingthevalley.com. The value we receive from Farm Bureau is that they work diligently to protect farmers and processors from over-regulation of our industry that is costly and counterproductive. To be more specific, the key issues include the areas of high speed rail, water, labor, and food safety.